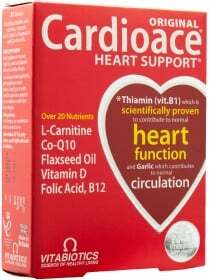 Specific nutrients to support cardio health including thiamine (vit. B1). Have a question about Cardioace? What is it, what does it do, how and when to use or something else? Ask us. One tablet per day with your main meal. Swallow with water or a cold drink. Not to be chewed. Do not exceed the recommended intake. Only to be taken on a full stomach. WARNINGS Cardioace : Always read the product directions before use. Do not exceed the recommended daily dosage. As with other food supplements seek professional advice before using if you suffer from food allergies, and consult your doctor or pharmacist if you have an underlying medical condition, or if on medication. Vitamin supplements are not intended to treat or prevent any disease. Food supplements should not be used as a substitute for a varied and balanced diet and healthy lifestyle. Do not take if you are allergic to soya.